A solid midsection can help you reduce the risk of injury. Increasing your core strength leads to better balance, agility, and strength. The equipment provides you terrific core strength, ripped abs and powerful back muscles. Target your lower back muscles with standing hyperextension exercises. Work your abs in 3 crunch positions ranging from flat to a 30 degree decline. You can adjust the angle of the bench to increase or decrease your workout intensity. You can do lots of other exercises! Like Incline and decline push-ups, bench dips and one legged squats. Or even exercise with dumbbells for bicep curls and one arm rows. Dumbbell stool is a special equipment for the gym, suitable for weight loss, practice muscle, restore the physical fitness of the crowd. ★SUPPORT: Dumbbell training, Ab core strength, sit-ups, push-ups, Like Incline and decline push-ups, bench dips and one legged squats. Or even exercise with dumbbells for bicep curls and one arm rows. ★ADJUSTABLE:Work your abs in 3 crunch positions ranging from flat to a 30 degree decline. 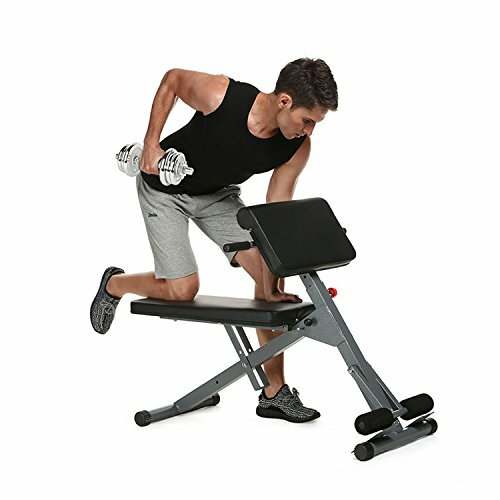 You can adjust the angle of the bench to increase or decrease your workout intensity. ★ADVANTGES: Strong Solid Core A solid midsection can help you reduce the risk of injury. Increasing your core strength leads to better balance, agility, and strength. Build Your Core The equipment provides you terrific core strength, ripped abs and powerful back muscles. Target your lower back muscles with standing hyperextension exercises.